Write a Book Online! Your first Kindle book, written, uploaded, published! Retirees: You can write a book online! Publish on Amazon as a Kindle book. This is the age of self publishing! No longer do you pay huge fees to publishers, you can do it all yourself, even if you want your book in print. 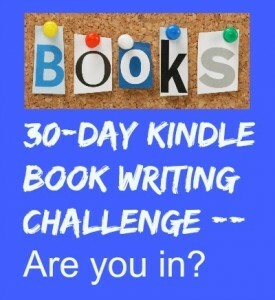 Write and Publish Your Kindle Book in 30 Days! This is a quick course to write and upload your first Kindle book in only THIRTY DAYS! You really CAN write a Kindle book in 30 days. If you are a writer, you will totally enjoy becoming a self-publisher via Amazon Kindle books. If you choose to write and publish in 30 days, this will not be your best book. You will simply write a book that will be a short-read book, and will be shown on Amazon in the Short Read category. All of my books are short reads! Later, you repeat the process over and over as you publish more Kindle books. You can also focus on longer books later, if you choose. It's fun! WHY bother with a "Short Reads" book? This is a new beginning for you. This course will get you a published book in 30 days. Retirees, Write that BOOK that's stuck in you! Are you in? You can connect with me during the course... if you are stuck, just add a question inside each module, and I can clarify for you! You can go further later, get one book published and start on another! Write a whole series once you find out how easy it is to self-publish a book nowadays! You can also offer a print book via Amazon, but that is beyond this 30 day course! p.s. You can redo this course over and over for future Kindle books. The following two books were published using this course. Click either book below to see the book on Amazon, and BUY one too! If you published a Kindle book after the class, please let me know so I can add it to this page. Thanks! P.S. Irwin Lengel is the first retiree to complete this course and publish his own Kindle Book. His book: Love Marriage Retirement Gratitude is right here if you'd like to check it out! Congrats Irwin! p.s. Irwin is publishing his second book, January 2018! Woot!